Assistant Chief Steve Coffey; Dr. Stanley Koontz, medical director; and Fire Chief Rick Zaccardelli are explaining the SEP program at the Havelock Fire-Rescue Department. As the opioid epidemic continues, responding in a positive, life-saving way that lacks judgement toward its victims grows more vital. 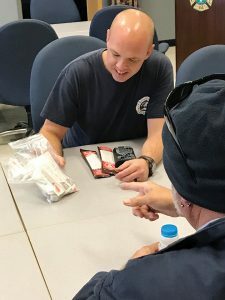 To address the epidemic, the firefighter paramedics of Havelock, N.C., have launched the first-ever legal syringe exchange program headed by fire and EMS in the U.S. 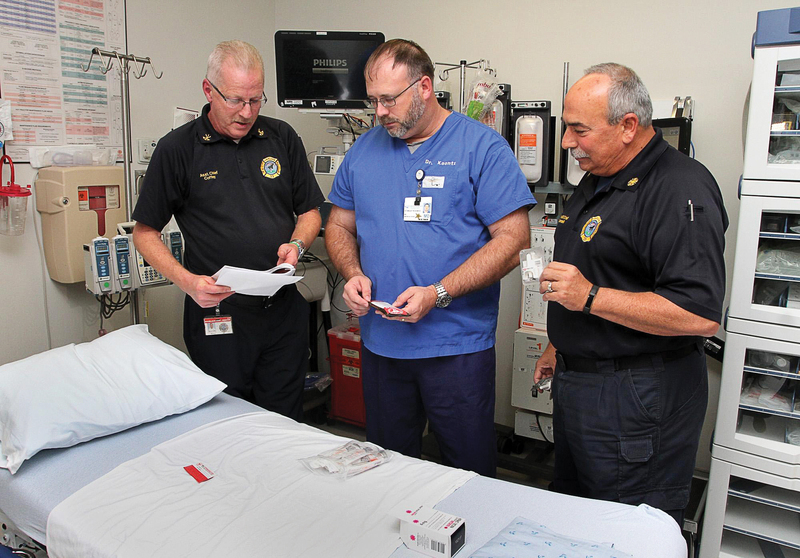 The Havelock endeavor officially began Nov. 17, 2017, as a group effort among Winslow, the medical director of North Carolina Office of EMS; Tom Mitchell, chief of NC OEMS; Robert Childs, executive director for the North Carolina Harm Reduction Coalition; Craven County Medical Director Dr. Stan Koontz; Havelock Fire-Rescue Department Chief Rick Zaccardelli; and Coffey, with the support of the city commissioners of Havelock. Coffey noted this particular combination of support was vital to HFRD launching the program. “Gaining community support is the biggest step,” said Coffey, “and developing relationships with different groups such as Harm Reduction, and finally, obtaining the support of commissioners as well as medical directors. There are now at least 23 — and probably many more — community-based SEP systems operating in North Carolina, but these are funded by private individuals or faith-based systems. 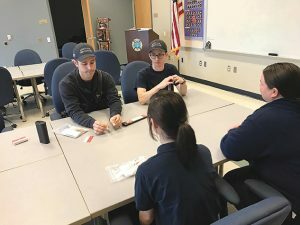 Through such SEP systems, firefighters and police undergo training on how to supply kits, syringes, sterile injection supplies and the antidotes to victims of overdose and how to collect used needles. Firefighter/medic Trevor Heath distributes syringe exchange kits at the Havelock Fire Department. “This program is not only for heroin users, but anyone who wants to discard their needles safely, but the main focus is on heroin/opioid users,” said Coffey, a 30-year veteran with the Havelock Fire/EMS Service. Most of the drugs the program officials are seeing are heroin laced with fentanyl or carfentanil (Wildnil), fentanyl, oxycontin, oxycodone, Percoset and methadone. The Narcan injection works within one to two minutes at a dose of 1 to 2 milligram and others may take five to 10 minutes with multiple doses of Narcan 2 to 8 milligram. “The biggest challenge is gaining the trust from folks in the SEP,” said Coffey. “We do not go out and actively search for IV drug users. In our area, we don’t have a problem with homelessness. We are going to start reviewing all OD calls and begin to make contact with the people the following day or two. The problem is many don’t want others to know about their addiction. Between HRFD and Medic 17, 350 needles have been distributed and roughly 240 needles have been collected, said Coffey, adding that he hoped there would be more as the program continues. Firefighter/Medics Chris Pereira and Brian Rice are preparing the syringe exchange kits for distribution at the Havelock Fire-Rescue Department. The number of Narcan rescue kits between the two departments is 12; nasal Narcan kits, including those from law enforcement officers is 41. According to Coffey, Childs with NCHRC is providing the funding for the initiative. In North Carolina, if it is the users’ first time signing up for the SEP, the SEP providers must supply Narcan, either nasal or injection. Furthermore, as mentioned earlier, the laws pertaining to Narcan distribution and syringe exchange, state that it’s against the law to use taxpayer monies for the SEP program. Coffey explained that one of the beginning challenges of the program was the public perceiving that their tax money would be used to help people who overdosed, and once it was explained that tax monies would not be used, public perception became more positive. Another false impression held by part of the public was that the fire department was complicit in enabling the overdosers by giving them clean syringes, and this, too, was not true. In fact, according to the World Health Association and the American Medical Program, it was estimated that SEP participants are five times more likely to enter drug treatment than non-participants. Coffey invites other fire departments to contact him for more information about Havelock’s SEP program at scoffey@havelocknc.us.